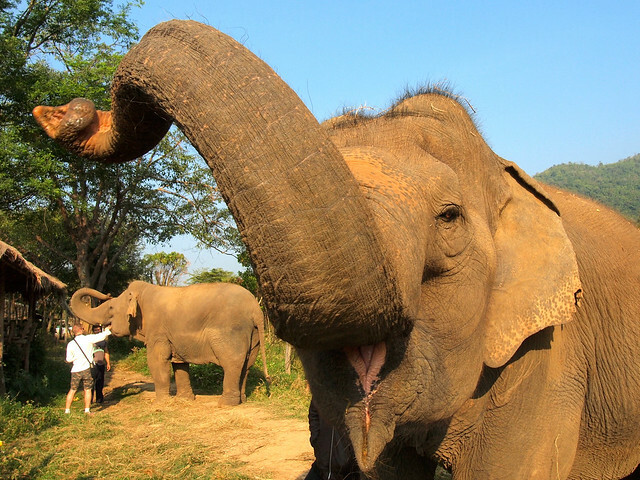 Home » Blog » Asia » Thailand » Volunteering at Elephant Nature Park: What’s It Like? This post was written after a volunteering trip made in February 2014, but information on volunteering is kept as up-to-date as possible! You may not know this, but I planned my entire Southeast Asia trip around doing one thing: volunteering at an elephant sanctuary. Ever since I first heard of — a sanctuary for injured and abused elephants in northern Thailand — a few years ago, I put “volunteering with elephants” high up on my bucket list. I knew about the plight of the Asian elephant, and I also knew what Elephant Nature Park was doing to try to combat it. Of all the elephant parks in Thailand I could have gone to, THIS was the only one I felt confident about — I knew my time and money would do good here. And so, when I decided to go to Asia earlier this year, spending time at ENP was the focus of my entire trip. 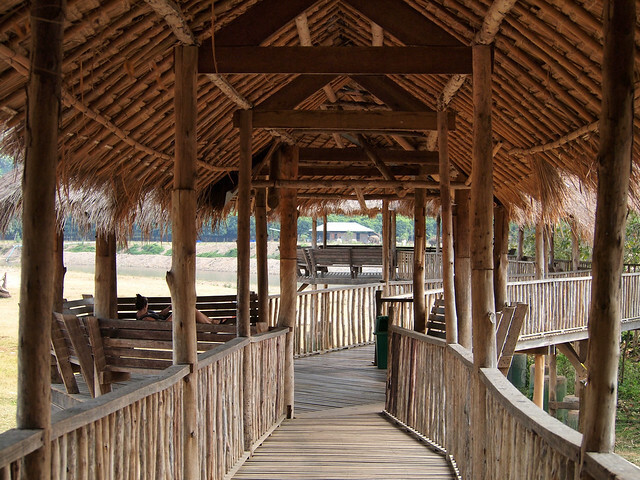 Elephant Nature Park offers a variety of options to visit and spend time at the park, including a volunteer program where people can spend anywhere from 1 to 4 weeks living and working with the elephants. I applied in November for a 1-week volunteer stint in February (spots can fill up quickly, especially during high season! ), and heard back within about a day that I had been accepted. I then paid a deposit, and began planning the rest of my Asia trip around that one week. One thing I have found is that, though there's a TON of information on the internet about Elephant Nature Park and the great things it does, there isn't a whole lot of detailed information about the volunteer program itself. So that's where I come in! Below are some questions I personally had about the program (and some that others have since emailed to me), and my answers to them after being an ENP volunteer myself. What will you do at ENP? 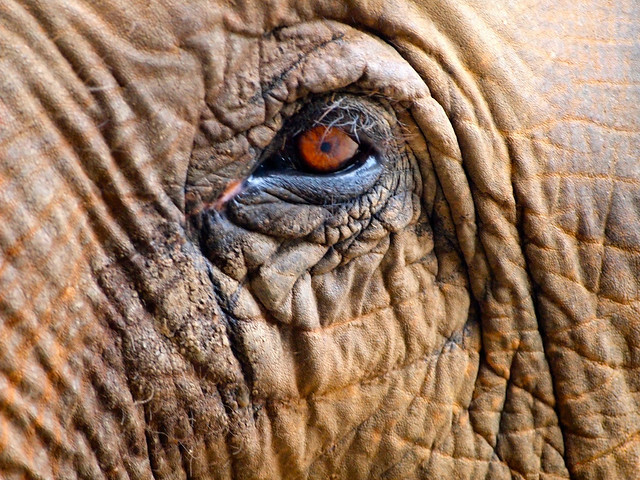 The biggest question, of course, is what do you DO as a volunteer at an elephant sanctuary? The number of volunteers at ENP each week can range anywhere from about 40 to 80 people. After you arrive at the park and get settled in, you'll be placed into one of 4 lettered groups (A, B, C, D). This group will be your work group for the duration of the week. There are a variety of chores and tasks to be completed at the park each day, and a whiteboard at the “Meeting Point” is updated each morning with information on what each group will be doing when. There are two “work” periods during the day: one immediately following breakfast, and one after lunch. The morning work period begins between 8 and 8:30 a.m. (breakfast is served promptly at 7 a.m. each morning), and the afternoon work session usually starts around 1 p.m., after lunch. You usually will work for 1-2 hours during each work period. Scooping elephant poo (morning job) — Armed with pitchforks and wheelbarrows, your group has to clean up the overnight mess in all the elephant sleeping enclosures. 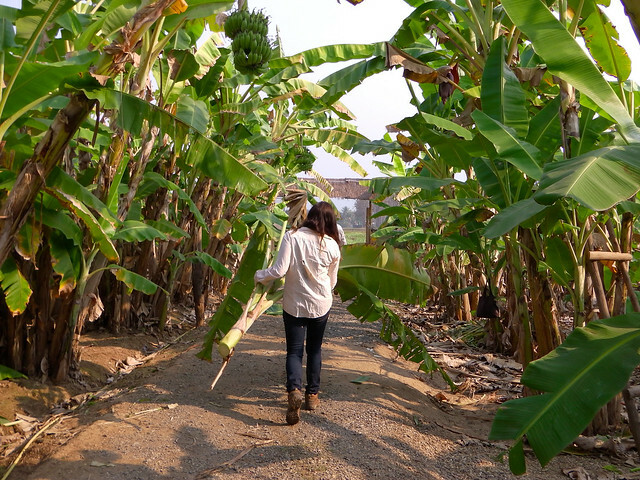 Banana tree cutting (morning job) — You'll be put into the back of a utility truck and driven about 45 minutes away to cut down banana trees and load them into a truck. Preparing elephant food (morning or afternoon job) — Basically cutting fruits/vegetables in the “elephant kitchen” and sometimes delivering food to the mahouts or elephants. Banana tree cutting (afternoon job) — The afternoon version of this job entails chopping the trees a group cut down in the morning into bite-sized pieces, and peeling the bark off them. Garden pole building (afternoon job) — You gather stones from the river, mix cement, and work on stone “fences” to protect trees and other areas that the park doesn't want the elephants to get too close to. Bamboo washing (afternoon job) — Rinsing off bamboo in the river. 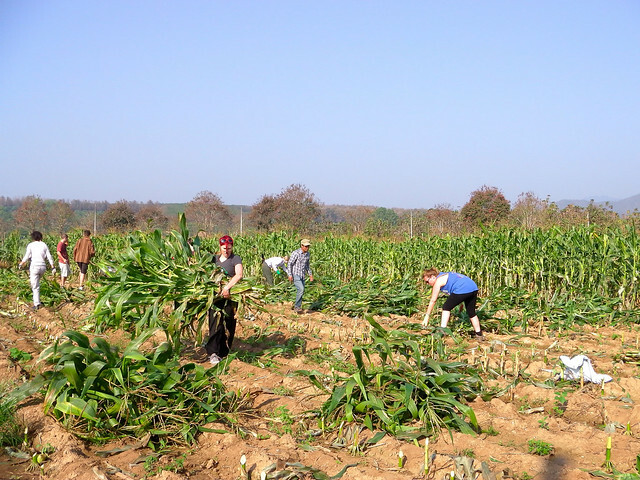 Grass/corn cutting (all-day job) — Every group will get assigned this task once, and it's definitely the most dreaded assignment among volunteers. You are loaded into a utility truck, driven about 40-60 minutes away from the park, and deposited in a field of grass or corn that needs to be cut down with machetes. You spend the next few hours cutting and baling grass or corn stalks. You then have lunch in the field, and then load the truck back up with everything you've baled. The good news? On the day you have this job, you get the afternoon off. The bad news? You aren't done until the truck is full, so these jobs take a while and are an exception to the “working for 1-2 hours at once” rule. 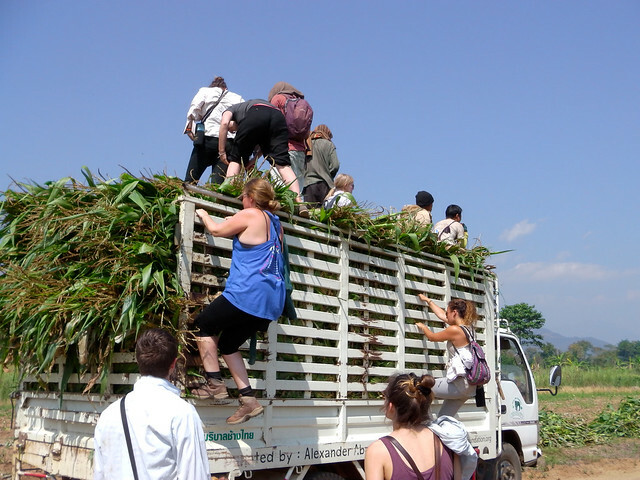 Random jobs (anytime) — You may also have to do things like unload trucks of donated food, or load bales of hay to deliver to elephants across the river. Your volunteer coordinators will stress that any work assignment can change at any time based on what needs to be done the most. One work period during your weeklong stay will be an “Ele Walk,” where the volunteer coordinators will walk you around the whole park and tell you stories about the elephants. This is always a favorite! And around 4 p.m. each afternoon is bath time for many of the elephants. All the volunteers take part in this on Orientation Day, and then you have the option of participating the rest of the time you're at the park. What can you do for fun? Even though you spend a good portion of the day working at Elephant Nature Park, you'll find that you have plenty of downtime, too. In the afternoon (especially if you have the work period off after grass/corn cutting), you can talk to the volunteer coordinators about going tubing down the river that runs through the park. 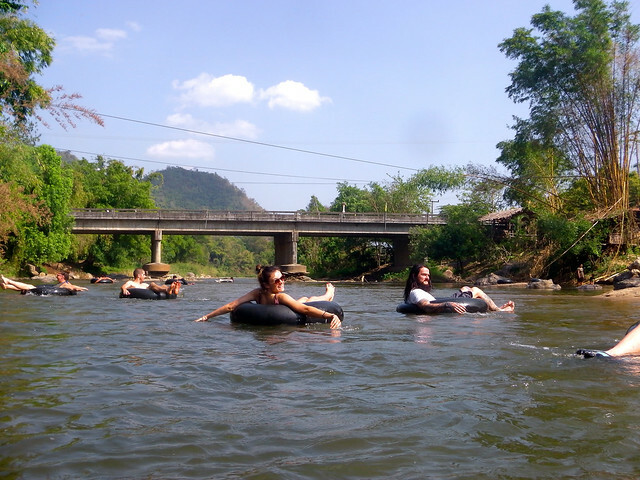 They will load you into a truck with a bunch of inner tubes, drive you a few kilometers up the road, and then deposit you in the river. You then float back to the park — it's a lot of fun! You can also hang out at the viewing platform or skywalk to watch the elephants or simply curl up with a good book (I did this almost every afternoon). Another free-time option is to go help out at ENP's dog sanctuary. In 2011, when Bangkok and Chiang Mai were subjected to severe flooding, Lek and her team rescued about 400 dogs that owners had abandoned as they fled their homes. There is a , too, but there are never enough dog volunteers, so they will always welcome extra hands to walk the pups or just give them some attention. In the evenings, the ENP staff will often coordinate an activity — for example, we had a blessing ceremony on our first night, an “elephant gossip session” with resident elephant expert Jodi, a Q&A session with ENP founder Lek, a Thai culture lesson, and a special farewell dinner with traditional music and dancing on our last night at the park. Later in the evening (like, after dinner), a lot of the volunteers in my group would wander up to a little convenience store in the local village to buy beers and snacks. We would sometimes stay there and turn the shop into a “pub,” and other times would go back to ENP to hang out on the viewing platform. Just keep in mind that “quiet time” kicks in at 10 p.m., and this really isn't the place to get your party on. There are also massages offered by women from the local village on the top floor of the platform for really great prices. These are also a popular evening activity! Note: Elephant rides are NOT offered at Elephant Nature Park — elephants are not actually built for riding, and it's actually kind of cruel. How much do you interact with the elephants? This is first and foremost a volunteer opportunity where you spend a lot of time doing tasks to *help* the elephants. But that doesn't mean that you don't get to interact with the animals on a daily basis. You may have the opportunity to help bathe and feed the elephants each day, and of course you can watch them in their daily interactions. At least once during your stay you'll also get to go on a “Ele Walk,” where you'll see many of the elephants up close and get to know their stories. There's NO elephant riding at ENP, and you also won't spend a ton of time touching or walking around with the elephants. The elephants at ENP have been allowed to form their own family groups and routines, and the goal of the volunteer program (and, really, everything that goes on at the park) is to make it as easy as possible for the elephants to live as “normal” a life as possible. This means that you won't be interacting with them 1-on-1 very often, since that would not happen if they were living in the wild. 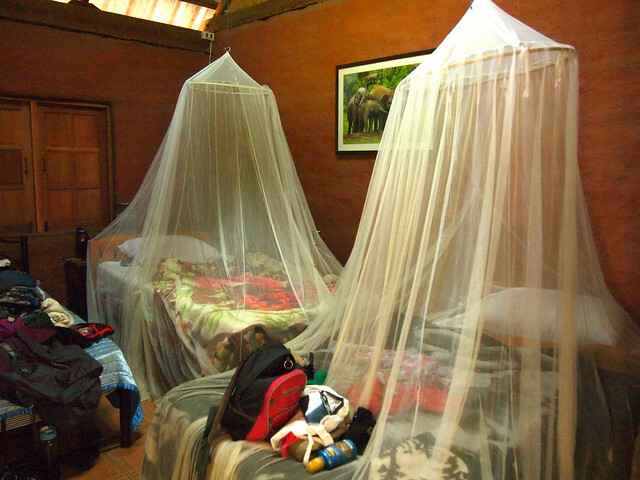 What is the accommodation like at Elephant Nature Park? Accommodations are provided in cabins, with usually 2-3 volunteers per cabin. You get a twin-sized bed with blankets and a mosquito net, and each room has a dedicated toilet and shower usually right across a hallway. I was actually pleasantly surprised by the cabins — they were rustic, sure, but they were more comfortable than I had been expecting. The showers are kind of hit-or-miss when it comes to hot water, but a mention of water running cold to the volunteer coordinators usually had the problem fixed within a few hours. If you're traveling with someone (be it a friend or significant other), you can get a cabin together. If you're traveling solo, you'll be assigned to a room with either one or two other volunteers of the same gender as you. There aren't safes in the rooms, so if you're traveling with any valuables it might be a good idea to invest in something that will help keep your things safe. I recommend , which you can secure to anything that's bolted down. What are meals like at ENP? Elephant Nature Park serves 3 meals a day: breakfast a 7 a.m., lunch at 11:30 a.m., and dinner at 6 p.m.
All the food at ENP is vegetarian. Don't let this worry you if you're not vegetarian, however. Each meal includes SO MANY different options that there is never any worry of going hungry. Even if you don't love tofu, there are always noodles, veggies, rice, and even french fries to fill your belly with. Water, tea, and coffee are all provided, and you can buy soft drinks for 20 baht (about 60 cents USD). There is sometimes also a little snack stand open near the skywalk where you can buy snacks (like chips and chocolate). What should you pack for Elephant Nature Park? Clothes you don't care about — Some of the jobs can get you quite dirty; don't bring your nicest duds to work in. Most volunteers wear shorts and tank tops/t-shirts, though keep conservative Thai customs in mind when you're packing (i.e. no booty shorts or tube tops, please!). I actually bought some cheap shorts and t-shirts at a market before my week at ENP, and then donated them to the park afterwards (they take a lot of the donated clothes to nearby hill tribe villages). Long pants and long sleeves — It can get CHILLY here up in the mountains in the evenings. You'll also want to have a long layer for grass/corn cutting day to protect your arms and legs from itchy cuts and scratches. Closed-toe shoes — You won't want to be wearing flip-flops for some of the chores. Instead of trainers, I decided to get a pair of . They have a closed toe, but still let my feet breathe! Sunscreen/a hat — You will definitely need it! Insect repellant — You will also definitely need this! Get the DEET-heavy stuff (you know, the stuff that's illegal in many countries). During the day you will get bitten by flies, and at night the mosquitoes will come out to feast on you. A torch/headlamp — After dark you'll want a light of some sort to help you get around (like, from the platform to your cabin or vice versa), and is always a great bet. 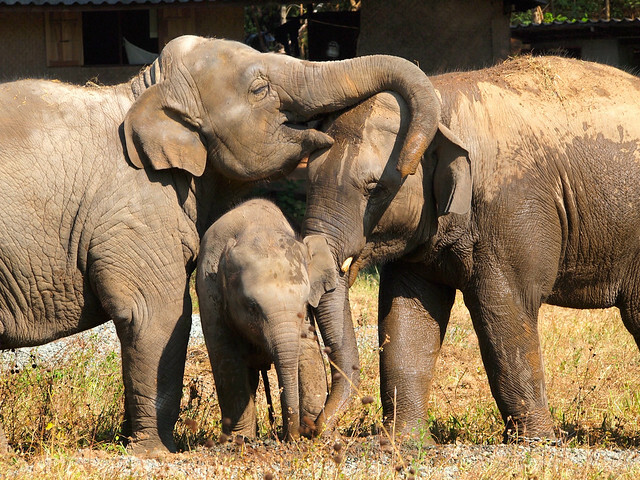 Earplugs — Elephants can be noisy. And so can the 400+ rescued dogs who call ENP home. If one of them starts barking at midnight, ALL of them start barking at midnight. So be sure to pack some good earplugs. A towel — You can rent one from the park (usually just old ones that previous volunteers have donated/left behind), but it's easier if you can bring your own. I recommend a quick-drying ! A sleep sheet — If you want an extra layer of warmth (or just an extra layer between you and the sheets if you're that type of person), I always travel in Asia with a . The silk is light and easy to pack, too, which is an added bonus. The park provides laundry service (60 baht per kilo), so don't worry about bringing multiple outfits for each day. You'll also be given a reusable water bottle and over-the-shoulder sling bag to keep it in on Orientation Day, which is very handy to take around with you while you're working. Is there wifi at ENP? Yes and no. Technically there IS wifi at the park, but it is down more often than it is working. We had no wifi the entire week I was there. The staff was nice enough to set up a wired laptop in the evenings, though, for anyone who needed to send a message home. If you want to be able to keep in touch with people back home while you're at Elephant Nature Park, you'll need an unlocked smartphone. Then you can buy a DTAC Happy SIM card. This is the ONLY SIM CARD THAT WORKS well in this part of Thailand, however. So don't get a SIM from AIS or any other Thai carrier, because chances are you will have no signal. I had a DTAC card (I think I paid around $20 USD for the SIM and 6 GB of data), and had strong signal at all times at ENP. 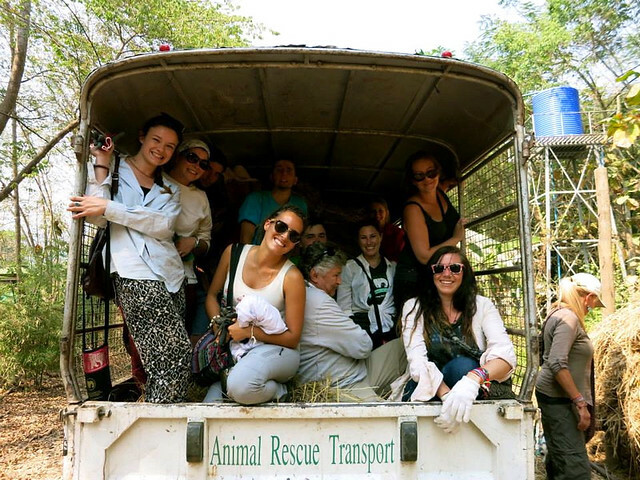 How much does volunteering at Elephant Nature Park cost? The volunteer program at Elephant Nature Park provides an important revenue stream for the park. So, yes, it's a pay-to-play type of experience. All of your money goes to running the park and it's projects, however, so you know it's going to a good cause. One week of volunteering costs 12,000 baht (about $365 USD in 2018). 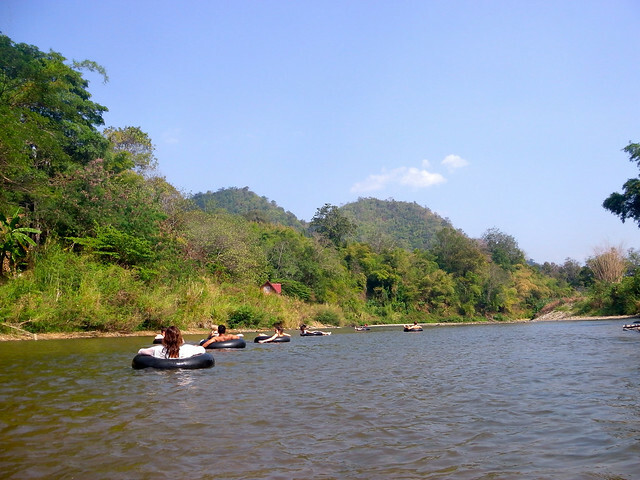 This includes transport to/from the park (from Chiang Mai), your accommodation, and all your meals for the entire week. You'll also get a volunteer t-shirt on your first day. Is this good for a solo traveler / couple / family? After writing this post, I received quite a few emails from all sorts of different types of travelers asking if I thought this volunteer experience was right for them. And my answer is almost always YES. I volunteered as a solo traveler – and I think the majority of volunteers are solo travelers, simply because Thailand is a really popular place for this type of travel. But there were couples, too, and small groups of friends. There were no families volunteering when I was there, but I think this could be a fantastic way for a family to bond and make some really cool memories. If you're traveling solo, you'll be paired up with another volunteer or two in a cabin. If you're traveling as a couple or family, though, you will likely get your own room. Am I too old / young to volunteer at ENP? Nope, you're probably not. Children 12 and older are welcome at ENP with a parent/guardian, and there's no maximum age for volunteers. We had two men above 60 volunteering when I was there. As long as you're willing to pitch in with the work, ENP would be happy to have you. You should also know that a volunteer week begins on Monday at 9 a.m. at the ENP office in Chiang Mai, Thailand. This is where you sign in, pay any balance you owe, and get your t-shirt. From there, you are taken by mini bus to Elephant Nature Park for your Orientation Day. Your week ends at 3/3:30 p.m. Sunday, and the same mini buses will take you back to Chiang Mai and drop you off anywhere within the Old Town. 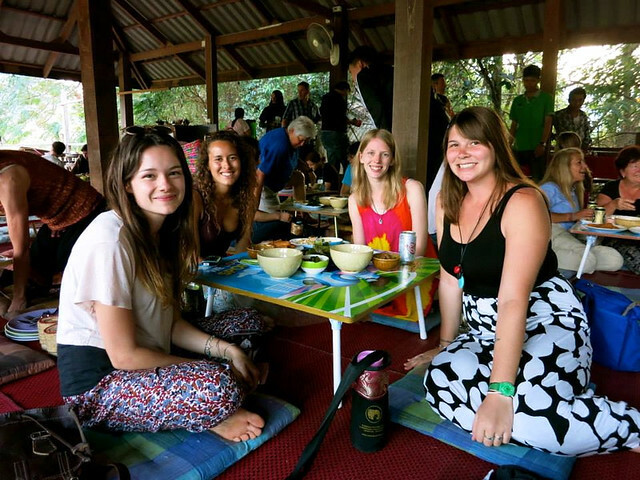 If you are volunteering for more than one week, you can either stay at the park on Sunday night, or book a hostel/hotel for the night in Chiang Mai if you want to go into the city for the night market or just to hang out with new friends. Where should I stay in Chiang Mai? 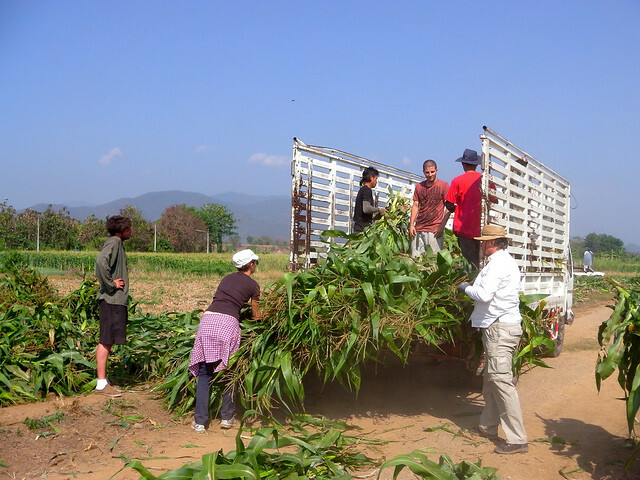 Most volunteers arrive in Chiang Mai on the Sunday before their volunteer week starts. Some guesthouses close to the Elephant Nature Park office (meaning you won't have very far to walk to catch your ride to the park the next morning) include , , and . All of these are very central and close to other noteworthy sites in Chiang Mai, too. Would I recommend volunteering at Elephant Nature Park? YES. Yes, yes, yes a thousand times over. My week at Elephant Nature Park was one of the most memorable and rewarding travel experiences I've had thus far. The people you will meet — the volunteers, the ENP staff — are incredible, the elephants are beautiful and worth getting to know, and the park's setting is beautiful and relaxing. I'm happy to have been able to support such a great place, and I would definitely do it again. Want to help but don't want to volunteer? Do you have any other questions about volunteering at ENP? Great post on the experience! I wanted to do a similar post but you’ve covered it nicely! Go for it anyway, Caroline! Akatuki, Thanks for the info. I too am a lone woman traveling alone from the midwest. I have never traveled before. Help! How safe do you think it is traveling around. As for the volunteer vets, I did meet a few of them, yes. They really got to be involved with the day-to-day care of the animals. But I’m afraid I don’t have details for any of them. You are awesome, as are your elephant pants. That’s all. Haha thank you! I knew I had to have some elephant pants to go work with elephants! I think Elephant Nature park is on my bucket list too! I have never done something like this, so I guess it would be a new and interesting experience (also enriching!). Thanks for the info. I had never done anything like the before either! But it was a really great experience. Yes, it really is tricky sometimes if you don’t know anyone who has done the same volunteering program! Luckily I knew some people who had worked at ENP before booking myself, so I was pretty confident that it would be fine. It ended up being even better than I expected! Very informative Akatuki. This is most definitely something I will be doing one day so I have filed this away for future info. I do love how it’s not all playing with the elephants. It really does seem like a good mix of labor, elephant interaction and fun with your fellow volunteers. It’s definitely a good mix! And, like many things in life, the experience is really what you make it! I would totally do it again someday. 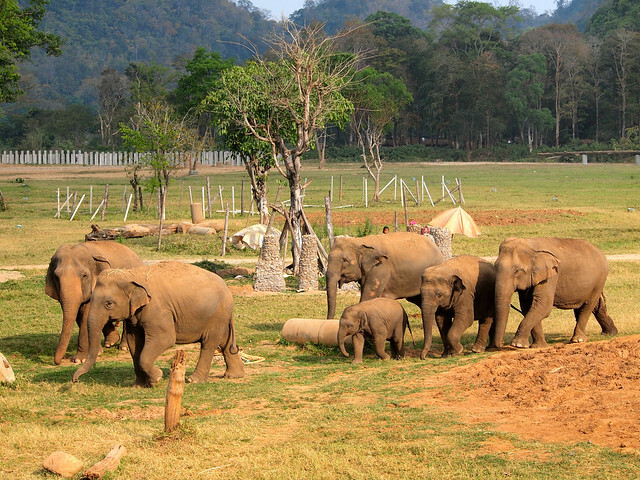 We visited ENP for the day and it was one of the highlights of our trip to Thailand. What they are doing for the elephants is wonderful and it is a great place for travelers to learn more about how elephants are treated and what can be done to make their situation better. 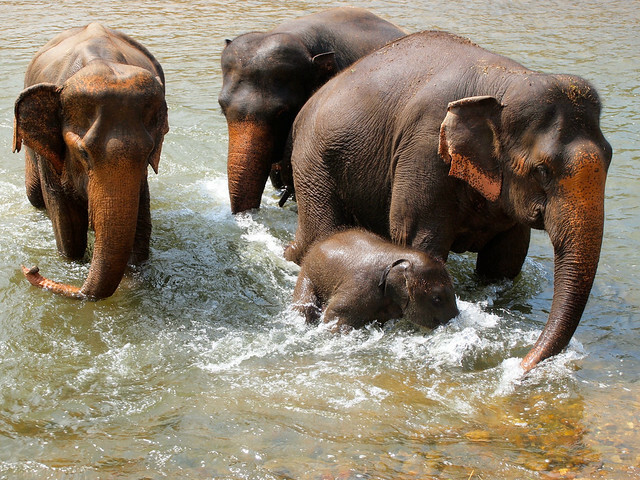 Elephant bath time is the best! Thanks, Katie! And if you love dogs, you should definitely check out the dog rescue volunteering program, too – they reallllly need help! 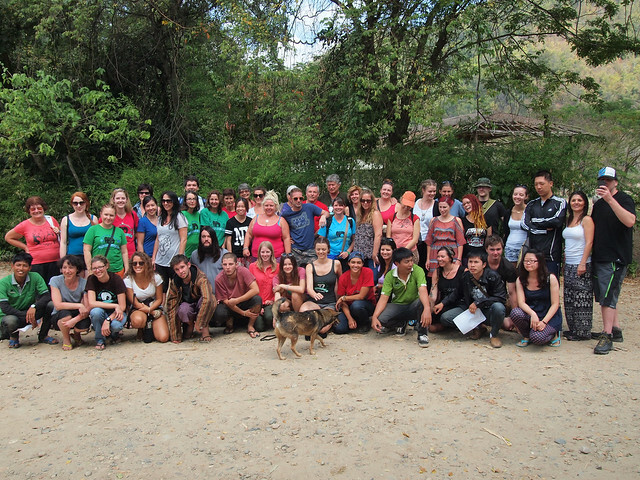 A lot of people would volunteer with the elephants for a week, and then volunteer for a week or two with the doggies. The way elephants are mistreated really upsets us. So, good on you for volunteering. We’d love to do the same one day. It’s definitely upsetting – I was really glad to be able to help in some way! Awesome post, Akatuki! I looked into volunteering when I was in India, but nothing seems to hold a candle to Lek’s park. Yes, Lek is certainly one of a kind! Hi what program did you look at in India? working at the conservation rehab and release center? what did you think that made you chose ENP? This is great info! I found from my experience as volunteering in a foreign country, there is often so little information on what the volunteer experience is actually like. There’s usually tons of information on the organization but not deep into detail specifics on lodging, meals, free time, etc. From your description it looks like ENP does an exemplary job of really offering a well-rounded opportunity for its volunteers! Thanks, Julie! These were all the things I wondered about before volunteering at ENP, so I figured I may as well answer my own questions and hopefully help some other people out, too. But yes, the experience is really well-balanced and was a lot more fun than work in my opinion! No, I never felt unsafe at all! The protests are confined to certain neighborhoods in Bangkok. If you avoid those neighborhoods (or just Bangkok altogether), you will be perfectly fine! Wow, good to know! The internet always makes everything sound a hundred times scarier than it really is. :O Sweet deal-i-o, hopefully I’ll be following in your footsteps in the near future, thanks for all of your awesome blogging! I really hope things will change in time, and that more elephant parks will switch to a more observe-only model! although it’s work, it seems to be a lot of fun! just recently I was visiting an elephant conservation in Riau (Sumatra), Indonesia. but it’s not as busy as ENP seems. I took part in bathing an elephant a little bit, and I fell in love with elephants! They’re so huge , yet so cute! I know what you mean – I fell in love with them, too! If you ever get the chance, DO IT! I absolutely loved your article. I am planning to go for march/April for about two weeks. Do you find the work too intense or a good balance? Thanks, Harina! And the work wasn’t usually too intense – and it usually didn’t last for more than 2 hours at a time. I’m sure you’ll love it! Thanks for that! Just another quick question about the rooming I know you have to share which is totally cool- were you paired with someone who is a similar age as you? I’m going to book my stay by next week. Your article got me so excited! Hey Lorenzo! I’m pretty sure they tell you to have cash to pay off your balance when you get there. I paid in Thai Baht. So yes, if you can get some ahead of time, that would be good! You should still be able to find an ATM on a Sunday, though, even if the banks are closed. Most convenience stores in the city will have them if you need to get some cash out. Sorry to ask abother question- I’m official booking but inward curious about the bathroom situation? Do you just share with two people? And is it a traditional Thai toilet-squat toilets? No worries! Each cabin has a bathroom across the hall, so you’ll share with 1 or 2 other volunteers. There are also shared bathrooms on the viewing platform. And nope, there are Western toilets at Elephant Nature Park – no squatters! Oh,may be yes,probably you are the same we talked on Lek support Group:),sorry for double question 🙂 ,one more thing..how many time before have i to confirm my volunteering ?,One month before it’s enough? thanks again,i will not ask nothing else :). If you’ve already signed up, I think they ask you to re-confirm a week beforehand. Read through the information they send you when they approve your volunteer application – everything you need to know will be in there! Hi! I’m heading there next week and this post was so helpful! Thank you so much! I do have one question… I’m arriving one day late which they said was okay, but I’m wondering if I’ll miss a lot? I want to be able to bathe the elephants and see the documentary and learn everything you learn in orientation. Do you know if they’ll catch me up? Thanks for your help! Hey Courtney! You’ll miss orientation the first day (and possibly the documentary), but you won’t miss out on anything else! You can bathe the elephants just about every day, and the majority of cool stuff they plan for the volunteers won’t happen on Day 1. If you miss the documentary, they usually play it every day for the day visitors – so just ask if you can sit in on one of those! Hey Becca! There are lots of guesthouses in Chiang Mai not far from the ENP office. I stayed at Smile House, a guest house less than 5 minutes from the office (). You can get a taxi from the airport, but you can also catch a songthaew, which looks like a red pickup truck with seats in the back – these are way cheaper. I got one that dropped me off more or less right at the guest house. Thank you so much for writing this blog…I’ve found it incredibly helpful and have actually decided to make my first international trip to ENP! I know that Becca asked some similar questions…but I was hoping to gather a few more details from you if possible. I will also be traveling alone, and as a young woman I am a little paranoid about my safety while maneuvering the airport/ground transportation to the park. I saw on their website (under FAQ’s) that a private vehicle can be arranged that will pick me up at the airport and transport me directly to ENP…was this something that anyone you volunteered with chose to do instead of getting a hotel the night before? Are you aware of any particular safety issues that I should be aware of? What was your communication like with ENP leading up to your visit? I am having a hard time retrieving many details about safety, etc. from them by email or by phone…I was just curious as to how I would arrange this private transportation or have any of my other questions answer prior to my trip? Thank you SO much for your time, I really appreciate it!! Hey Sami! I’m afraid I don’t know of anyone booking that private transport – if you’re flying into Chiang Mai, it’s pretty easy to get safely into the city though. Just be sure to ask about the taxi price before you get in – some have set fares. As for communication with the park, I did get confirmation emails from them, but I didn’t try asking them any additional questions. Did you try ing them on Facebook? Maybe you’ll have better luck asking them stuff on social media! Hi Sami! When are you traveling there if you don’t mind me asking? Also I was very concerned about the same things and what I believe I’m going to do is arrange for the hotel to pick me up from the airport on sunday and then have the ENP pick me up from the hotel on Monday morning. Excellent post, thorough and informative. I would love to do this. I do have one question for you. In all the photos, it looks like most of the volunteers are fairly young. Were there any volunteers there who were “older” travelers? I’m healthy and strong and not worried about being able to do the work, but the fact is I am probably old enough to be your grandmother! That is what my blog is all about, inspiring and empowering older women to travel more and do it more adventurously! I’d love to hear your take on this. The volunteers definitely tend to be in the 20-30 age range, but I think part of that just has to do with the fact that it’s mostly younger people (i.e. backpackers) traveling in Thailand. There WERE people of all ages, there though! There was a group of older ladies that come back nearly every year, and they end up working on special projects of their own. There were two older men in my group, too – both in their 50s/60s. The really fun part about ENP is that everyone is there for the same reason. So the ages don’t really matter so much since you all have a love of elephants in common! I think you should definitely do it! Thanks for the encouragement, Akatuki. I’m putting it on the list! You have made the whole experience come alive and have made me want to be part of it. Thank you! Thanks for all of this info! I am a single woman traveling alone for the first time outside of the US. I, like the rest of the volunteers, love elephants. I am so excited for this trip! But also like some of the commenters on this page, I do have some apprehension about traveling to a foreign country alone and getting around. I am curious if anyone plans on staying in the city on Sunday night before the park? I would love to connect with other travelers who may be going at the same time as me… the first two weeks of May 2015? Glad you found this post helpful! And don’t be too nervous – Thailand is quite tourist-friendly! I have the week booked starting the 4th May! Is that when you’re going? I will be arriving the day before in Chiang Mai. I have been to Chiang Mai once before and was going to try book the place I stayed last time (I can’t remember the name). I’d love to meet up! And I can let you know where I’m staying once I figure what it was called! Also thank you Akatuki for your great post! Very helpful! Thank you so much for writing this detailed account. It was VERY helpful. I’ve wanted to volunteer at ENP for years, but am waiting until my youngest is old enough to go with me. Were there any teens in your group? I don’t think there were any teens in our group, but this would be a fantastic experience for a teenager! Do you think this kind of volunteer project would be good with a spouse? I really want to do it (and bring along my husband!) but do you think it will be awkward? Are most of the people solo/young travelers? Wow this is such a cool opportunity! Thanks for posting and sharing your experience! Is there an age minimum? Is this something I could do with my 14 yr old son? I’m considering “worldschooling” him next school year. I want to find volunteer work (with minimal costs), cultural activities, and small paid jobs even that are completely different than anything in Minnesota! Haha doesn’t take much. Anything else you recommend I check out? Hey Kristin! They recommend kids be at least 12 (and of course younger kids require a parent/guardian to volunteer with them). So yes, this would definitely be something you could do with your son! It’s a great volunteer experience. You can also volunteer with their dog rescue center (located in the same place as the elephant program). I know quite a few people who would volunteer with the elephants for a week, and then spend a week or two volunteering with the dogs. Hey Akatuki, my bf and I are considering doing this week volunteering experience in a couple weeks. He is nervous/kinda grossed out about the shovelling poo tasks…is it pretty crazy or made up for by the awesome experience? Also do you know of any other similar “volun-tourism” experiences in Thailand or Laos? Thanks for your help! Haha, poo duty really isn’t that bad! Elephants mostly eat grasses and fruit anyway. And you usually only get put on poo cleanup once in the entire week. So yes, I would say the rest definitely makes up for it! The work you do IS hard at times, but it never lasts long and all the rest is so great. I haven’t done any other volunteering in Asia. And I would be careful about other experiences that involve animals or people – not all of them are legit, and sometimes you could actually be hurting more than helping! ENP is definitely a good bet, though. Hi there, i’m interested in volunteering here next month. I would be traveling alone as a 34 year old woman. Did you find Chiang-Mai to be fairly safe. I doubt i would venture out of the sanctuary but i am curious. Is everyone friendly? I loved your post and your video. It’s enlightening, inspirational as well as informative!! Chiang Mai is very safe, yes! 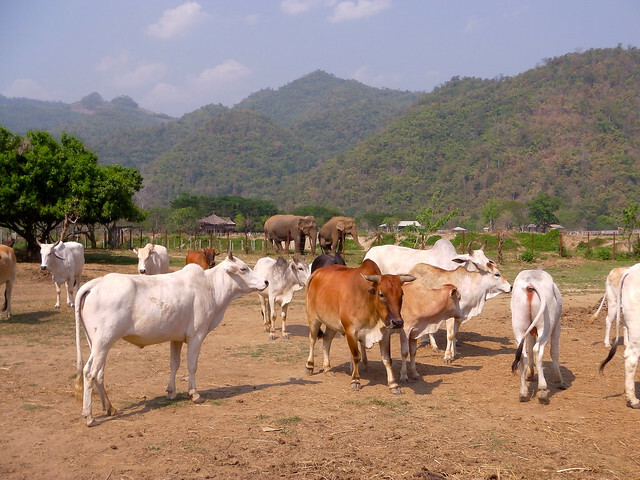 But it’s not actually right outside the sanctuary – ENP is about an hour and a half from Chiang Mai (they take you there in a van on the day your volunteer week starts). But you could always stay in Chiang Mai and explore a bit after your week at ENP. 🙂 There are lots of expats and foreigners in Chiang Mai, along with plenty of markets, restaurants, temples, and even shopping malls when you leave the walled Old Town. I was searching for info about the two volunteer programs (elephants and dogs) that they have at ENP and I found your post. I loved it! One day soon, I will have my own blog to write about my travel experiences and I want to do it like you did, very detailed and well explained. Thank you very much for sharing this with us. Firstly, thank you for the wonderful and informative blog! I have two weeks volunteering booked for elephant nature park, and I was hoping you could answer a quick question for me, is it possible to charge your camera battery at elephant nature park? I imagine I’ll want to take a lot of photos and the battery won’t last anywhere near two weeks without a few charges! Hey Aine! Yes, you’ll definitely be able to charge your camera. You’re out in the jungle, it’s true, but ENP does have electricity. 🙂 Just be sure you have an outlet adapter for Asia, and you’ll be good! No problem! You can feel free to comment here, or to email me – adangerousbusiness [at] gmail [dot] com! I’m so glad you stumbled upon my site, Kathleen! Always great to meet others who love ENP as much as I do! i am leaving on Wednesday to go here. I am so excited. I am bringing my 19 yr old daughter with me so she can get a once in a lifetime experience before she goes off to college and becomes her own person. Is there electricity in the cabins ? do we need any type of fan ? neither of us are great sleepers could ear buds and smartphone on noise work ? Did anyone get a stomach bug . ?? What a great experience to be sharing with your daughter! If you’re light sleepers, I would definitely recommend ear plugs. The elephants can be noisy, and so can the hundreds of dogs at the ENP dog shelter. And nope, nobody caught any stomach bugs there! The food is all delicious and there’s plenty of drinkable water available. 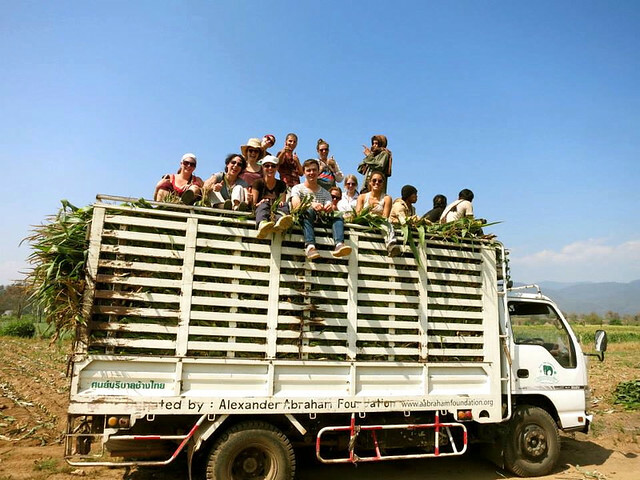 Thank you for your blog post Akatuki, I came across it while searching “the best place to volunteer with elephants” there are so many different places I had no idea how to pick which one I wanted volunteer at but your post has swayed me! I was initially put off a bit when I came across ENP myself because it’s a tourist attraction and I thought that kind of defeated the point of taking elephants away from the tourist business but now I see it’s not like that at all! I’m hoping to go with my boyfriend, were there any couples or groups there when you went? Hey Alexa! ENP is definitely your best option to get up close and volunteer with elephants. There were indeed couples there when I was volunteering, and I think it would be a really cool thing to do with your boyfriend! As for how much interaction you get with the elephants, it’s actually a lot! 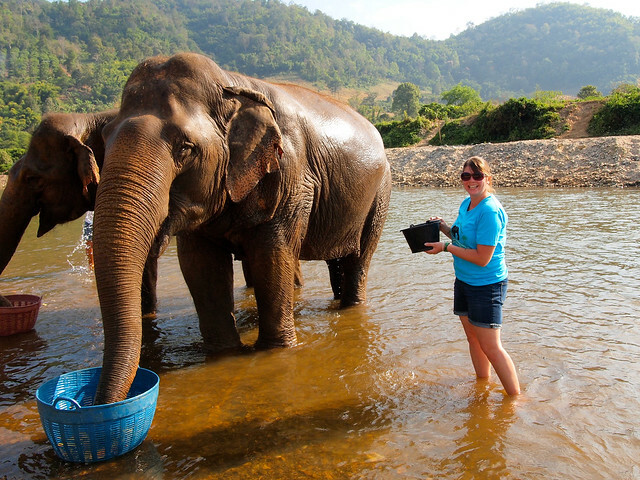 Many of your “jobs” require you to interact with the elephants, and you can help bathe them in the river every afternoon. You can also go on “ele walks” to learn more about the individual elephants (and of course take photos! ), and in your free time you can hang around the platform, where many of the elephants hang out to be fed. You will NOT be able to ride the elephants at ENP – and I would advise you not to do this anywhere! It’s actually really bad for the elephants. I’d like to chime in here, with Akatuki’s permission. I visited ENP in 2009 with my husband, and we found it to be very (very!) romantic. There was only one other couple at the time that arrived together, but there were a few others that found each other there! Whether working alongside everyone during the days or sitting around a campfire at night, we never felt awkward being a couple, and we had plenty of privacy in our cabin. When we walked up to Elephant Haven for the night, everyone slept together under a rustic lean-to so that was a little different, but the experience was fantastic and very worth giving up our privacy. As far as riding elephants, Akatuki’s right that’s it’s not good for them. My husband and I met in an Italian circus almost 30 years ago, where he was the caretaker for the elephants. (He joined in hopes of bettering the elephants’ lives, and I, searching for my next great adventure, joined on a whim a year after he did.) We worked alongside them for years. There are varying opinions on whether one human riding an adult elephant will physically hurt the animal — or hurt them any more it hurts a horse to be ridden. Not riding them and/or making them paint, etc., is a matter of respect and conservation because you’re not financing and encouraging the players in the tourist trade who profit off keeping elephants in less-than-healthy conditions. With her park, Lek has created a place where they can live in peace without being forced to entertain or earn tips in exchange for their room and board. It’s the correct and honorable thing to do. Perhaps that’s not what you’d expect to hear from an ex-circus performer who rode an elephant in the show, but after our circus experiences, my husband and I feel so strongly against keeping elephants or any other exotic animal for entertainment or profit that we still make a monthly donation to ENP. In any event, I highly recommend visiting the park! Thanks for that perspective, Kathleen! Thank you so much Kathleen! I, too, am a massive animal lover and am against exploiting any animal for human pleasure so would never ride an elephant now I know it’s not good for them. I was just a bit confused because some volunteer places I have come across there are pictures of volunteers on the Elephants which is of course an amazing experience IF it did no harm to them. Thank you both for making it clear! I would hate to go somewhere and made to feel like it was ok to then find out afterwards it was the wrong thing to do, whether it be physically or mentally. I’ve read this at least 15 times as I prepare for my trip at the end of October, thank you!!! How were the mosquitoes when you went and did you get any vaccines before going? Thanks! So glad I could be of help, Samantha! I definitely got some mosquito bites, though the flies were actually worse! (It got quite cool at night, and the bugs weren’t really out then.) I recommend getting some bug spray with LOTS of DEET (like, so much that you probably can’t buy it in the US) – that’s the only thing people said were working against both the mosquitos and the flies. And no, I didn’t get any vaccines! You *could* get an anti-malarial, but malaria isn’t very prevalent in that part of Thailand, so I opted not to. I’m so happy I found your post. This makes me want to volunteer even more so!! We do have this on our to do list, and your post sums up all the info required. Akatuki, GREAT post. Seriously it’s very insightful. I’m going to be volunteering in the summer and I just have a quick question. Once you arrived in Thailand, did you go straight to the Nature Park or did you stay in a hotel then go to the park the next day? I am trying to determine full cost right now so your answer will be super helpful. Again, thank you for sharing your experience I am so excited to go! I arrived in Chiang Mai a day early and stayed overnight since the meeting time for catching your ride to the park is quite early! I don’t think it’s possible to arrive the day-of, unless you want to organize your own transport to the park. Thank you! Where would you advise staying in Chiang Mai? There are a lot of good guest houses. It’s been more than a year since I was there, though, so I’m afraid I don’t have any specific suggestions! I stayed at a place called Smile Guesthouse, I think. Thanks for the great information! I was wondering if you feel it would be safe for a single female to travel there alone? Yes, definitely! I traveled there as a solo traveler and never felt unsafe. 🙂 Plus, you’ll be with other volunteers most of the time! This has been a huge help. My husband’s bad back would not allow all of that physical labor, so you saved us big time. We will need to choose a shorter visit option. ???? Thanks a million! You should still consider booking a day trip visit! You’ll still get to feed and bathe the elephants, but without the heavy lifting! This helped me so much! Thank you! So it is possible to stay up to 4 weeks? Because on the websites it says only up to 2 weeks, or up to 4 weeks for vets..
You would have to ask ENP – I’m not sure if you would be able to do four weeks with the elephants (but you probably could volunteer for 2 weeks with the elephants and 2 weeks with the dogs!). I want to do the same, maybe this year! Can you tell me the amount that you have to pay to confirm the reservation? I’m not exactly sure of the amount, as it’s been a couple years since I volunteered. It was a percentage of the total, though – so maybe $100 or so? You can always email ENP to find out for sure! This is a wonderful post. Can you please recommend the hotel/hostel you stayed at prior to the trip? It is my first time in Chiangmai and I would love to explore the place either before or after my 7 days volunteering! Thank you so much! Sure thing! I stayed at the Smile House Guesthouse – it’s actually linked in this post in the “What should you know?” section, under the photo. Hi! I’m going in the summer with my friend, we booked separately though should we email ahead of time and ask to be put in the same room or is that arranged when you arrive? Thanks so much! It wouldn’t hurt to send them an email ahead of time – from what I remember, they already had the room assignments set up when we got there (though it probably wouldn’t be too difficult to change!). This sounds like such an amazing thing to do. 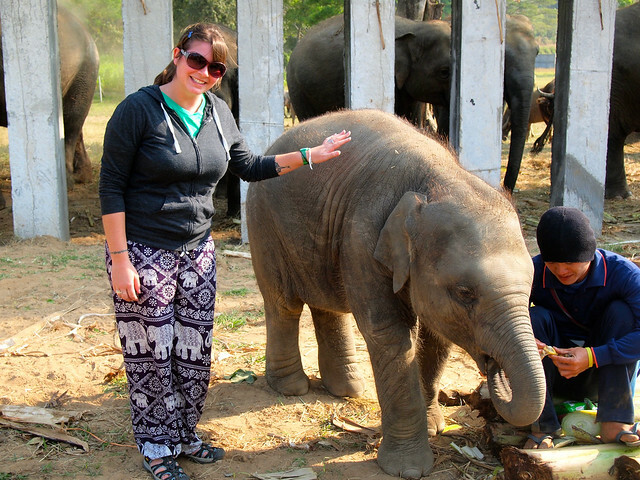 I am backpacking around Asia and would love to volunteer with the elephants and the dogs. As I am carrying a few stuff already, was it safe to leave everything behind at the accommodation? It seems that most people are just there for the volunteer work. -should I bring my own shampoo/wash? -did you find most people spent their spare time helping the dogs, or was everyone usually too tired after the elephant work? Yes, bring your own shampoo and wash, as none is provided. And yes, you can bring your phone when working, but I would make sure you have a secure pocket to keep it in so it doesn’t fall out/get dirty (some of the work WILL get you dirty!). Also, I believe it is rain season during June, what happens when the rain hits? do we still work? as I read the rain comes hard but fast. I can’t speak to that since I went in February. Yes, I imagine you’ll still work, but I’m sure they would let you shelter during any heavy rain that comes through. The website has been updated so you can see the dates available and make the deposit for confirmation straight away now I believe. I really need to get the opinion from every one or anyone who’s gone. HELP!!!! Do you think going for 1 week is enough? I unfortunately can’t speak about the vet program since I’m not a vet. I think they do prefer vets spend longer than a week, though. As a regular volunteer, a week was long enough (but I was also traveling elsewhere in Southeast Asia for a few weeks, so it wasn’t just a 7-day trip for me). I’m a vet nurse who did the vet program for a week. I would say just go for the week if you are that keen to go soon. The other veterinary people I did it with just did the one week, it’s so popular and they can’t take many at a time so don’t think many get to do more than a week. Unless they plan way way in advance! Why don’t you stay for longer but do a week with the dogs and a week as a regular volunteer? You are still there and if I had my time again that’s what I would do if I had the time. And make sure you leave yourself some time to travel! I’m so glad to hear from a vet who was there what did you actually get to do with the elephants in terms of medically treating them? There is only 1 week available now I believe I can’t stay any longer thats it. so I can’t say i’ll help dogs and stay longer . I don’t mean this to sound terrible ,I am not going for dogs, we have so many here who need help too. Of course when I’m there I would help with dogs I am going for the elephants with little money I need to spend time with them . I don’t even have enough to travel around. did you say you guys only stayed a week? was that your plan with the elephants? was that enough time. how was the week Where did you travel from . I was told December was horribly cold but from what you are saying thats not true. I am so torn right now help!!. Hi Nan, I went on my own but all the other vet volunteers were also staying just for the week, but were also doing travel before or after the elephants. Basically you assist the permanent vet and vet nurse with their duties. So a normal day you help out with the treatments like foot baths, abscess drains then usually go over to the dogs and help out there then in the arvo there’s more treatments then there might be some non-daily duties like worming. You also help prepare food that is used while treatments are being done to keep the eles from taking off. I meant as well as the dogs you could do a week or two as a regular elephant volunteer, which is what Akatuki did. So you still have plenty of and learn about the elephants and then also meet and create friendships with the non vet volunteers. And even with the dogs you still have the elephants around which is nice. It does seem a very long way to come for just a week so if you definitely want to just do vet volunteering I would lean toward waiting until you can volunteer for longer. I came from Australia and was away for about 3 weeks. It’s around a 9 hour flight. I hope I’ve answered everything! Thank you for your help!!!! December is generally a good time to go. The “cool” season in northern Thailand runs October-February, meaning you shouldn’t run into much rain or any haze from the fires that sometimes burn during the hot season (and this is also why ENP gets so booked up during those months!). You could consider doing what Melissa suggested below: do the vet program for a week, and then see if you can volunteer with the dogs for an additional week. When I was there, they were always short on dog volunteers. The dogs are still at ENP, though, so you still get to be around the elephants and other volunteers, too. Oh and I went in May but have been in northern Thailand in December before and the weather was great, hot during the day and a little cooler at night. Thanks so much, Niki! I’m so happy that this post is still helping and inspiring so many people! Hi amanda ! Thanks for all the information, Im going to ENP in my honeymoon!. And then to travel thailand. Do you know if we can get a cabin just for the two of us? Hi Silvia! I’m not sure, but you can always ask for a cabin for two (some have 3 beds, but depending on how many volunteers there are, they only put two people in some cabins). Hi Silvia, when my husband and I visited in 2009, we had a cabin to ourselves. It was rustic, but oh so romantic. Lek and the others there are welcoming and accommodating, and would expect that if you let them know that you’re on your honeymoon, they will do everything they can to get you a private cabin! Good question, Evelyn! And yes, it’s not a bad idea to get there a day or two early to give yourself time to get over the jet lag. I was in Southeast Asia for a couple weeks before and after my volunteer week, so I would definitely recommend seeing some more of Thailand before/after if you have some time! Hi Akatuki thank you so much for this post. I was very apprehensive to go and after reeding your post I decided finally to book my volunteer week in the beggining of november:) I’m so excited and counting the days! – did you exchange your money in Thailand? Or did get the money before travelling? – do the accomodations have door lock? Or there is some place where we can leave money, cellphone, cards etc. – did you buy a local SIM card for your phone? Hey Daniela! Great to hear that you decided to go! I always take out local money/exchange when I get to a destination. And yes, I did buy a SIM card (not all of them will work at ENP, though – the one that will is mentioned in the post). I *think* I remember that the cabins all had padlocks on the doors, and that one person from the room would be responsible for the key. But I’m not 100% sure as it’s been a few years! And no, I haven’t done any other volunteer programs – this was my first! Great post and thanks for the helpful info! i’ve been doing some research on ENP. Do you remember how many volunteers were in your group? Did you ever find it over-crowded or were the groups evenly distributed among the park? My biggest concern is the amount of volunteers I’ll be with. i’d prefer a smaller group but i know they tend to accept up to 70 or more volunteers each week. This is amazing! I’ve always loved elephants and would love to do voluntary work with animals in the future, and this is definitely something I will have to look in to! I’ve got this years travel plans sorted already, but I will certainly be looking in to this next year! Thank you for this post, it’s really informative, and it’s certainly given me inspiration! It still ranks up there as one of my favorite travel experiences – definitely do it if you ever have the chance! Hey I’m going to the elephant nature park in 5 weeks to volunteer, I’m really excited. I just wondered whether the park is a malaria zone? I’ve been told by my doctors I won’t need to take malaria tablets, as chiang Mai isn’t a zone. But I’m not sure whether the EN park is? Thanks so much for writing this! So useful. Thank you for replying! You’ve been so helpful. Just out of interest, did you go in rainy season or the hotter drier season? Would a rabies jab be a good idea? I’ve read on their website about it. Thanks again! I went in February, which is considered “cool season” in that part of Thailand (it was still quite hot, though!). I did not get any vaccinations for my Thailand trip, but some people do get rabies shots just in case. So happy to hear that, Kathleen! You’re going to have an amazing time! Would you say 5 months out is a decent amount of time to book a weeks experience? The volunteer slots at ENP fill up really quickly, so I’d say book as early as you possibly can! I am so happy I ran into your post. I am planning on traveling to Thailand and booking a week at the park. I am also a photographer. Actually I am taking this trip as a step into my dream, the world of travel and documentary photography. I was wondering if you had the opportunity to take a lot of photos of the elephants and how open are the people running the park are to that. I was hoping I could take a bunch of photos of the elephants and eventually continue my support of the park by sending portion of the sales of the photos to the park. Do you have a there? Thank you so much! Your post is exactly what I have been looking for, as you said there is very little information about what you actually get to do when you are there. You are definitely free to take all the photos you want! I don’t have a at the park any longer, but if you reach out via email they will put you in touch with the proper person! If you let them know when you arrive that you’d like to do this, they may arrange more ele walks for you so you can get even more photos. Hello I was wondering if you could help me out again, my friend who’s travelling with me to the park wants to know if its better to bring a big rucksack for storage on the plane, our itinerary says we are only allowed one small backpack and a large one. However, my friend wants to take a normal luggage case for transport, instead of fitting it into a larger backpack. Could i ask if you just took a rucksack or? Or what you’d recommend? Hey Ruby! I went on a 6-week backpacking trip around Southeast Asia (which included a week at ENP), so I did indeed just take a backpack. It’s easier to get around with a backpack in that part of the world (the ground is often not ideal for dragging wheeled luggage around on). Hi amanda, thank you for informative post! Me and my friend are volunteering for 1 week at ENP in december. I’m so excited? Hey Sam! In general it’s just easier to have a backpack in Southeast Asia (suitcases can be tough to drag around!). If you absolutely need to bring a case, though, I would maybe email ENP and ask them about it. I had a backpack, so I don’t have any advice on any other sort of luggage! And as for my passport, it was just in my bag in my cabin the whole time. I never stress out about it as much as I probably should… haha. Excellent detailed post on what to expect when volunteering here. Looks an amazing experience and something we will definitely do in the future. Many thanks! It was so much fun – still one of my favorite travel experiences! Hi Akatuki, I was wondering if you needed any type of work permit for this? I read somewhere that Thailand requires a work permit even for volunteer work. Loved this informative, encouraging, and upbeat post…as I plan to volunteer there. Much appreciated, Akatuki! Hi Akatuki! Thanks for all this great info! A few questions – does the park send you a final confirmation email before your trip? I booked mine in July and am going in December. Just wondering if they will send me anything other than what I got when I first booked. -The website mentioned they can pick you up from your accommodation if it’s within the radius they approve, but your blog made it sound like we would have to walk to the ENP office to be picked up, should I expect to make my way to the office just to be safe? – Did you carry your camera/phone around with you at all times to take pictures? If so did you get something waterproof to put it in? Thank you so so so much! I can’t wait to go!! Hey Romina! I’m glad you found the post so useful! I honestly don’t remember whether I got a final confirmation email from them or not since I went a couple years ago now. And as for pick-up, I don’t think that’s something they offered when I volunteered. I stayed just around the corner from the office, so it was no issue for me to just meet there in the morning. I would email them and ask about it, though, if you’re interested in getting picked up. Thanks for the reply Akatuki! I had another question – where did you buy your sim card from? Is it something I can do at the airport or will I have to find a cell phone shop? I actually didn’t fly into Bangkok (I arrived via bus from Cambodia), so I simply went to a shop to pick up a SIM card. But you should definitely be able to get one at the airport. I would email the park to check, but I think there are certain areas where you are allowed to smoke. Hi Akatuki, your article on ENP was just fantastic. 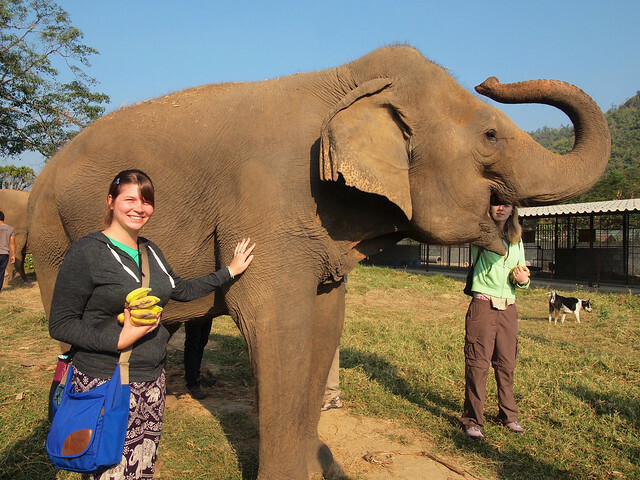 I visited Chiang Mai last month & did a half day elephant tour at the Elephant Sanctuary camp 6 which was just awesome. Since returning home I decided that I wanted to volunteer with the elephants but had reservations, as I too would be a solo female traveller (a bit older than you though) & had a lot of questions – all of which you have answered for me in your posts – except for one. Did you see a lot of snakes? Because of your brilliant article I have now booked at the ENP for a week in November 2017! I also love dogs, will I get enough time with the dogs there too & can you spend all your free time with the dogs? And when I was there you could definitely spend all your free time with the dogs if you wanted – after all, it’s your free time! You can’t really go and hang out with them on the ground whenever you want, simply because they have their routines and also because they don’t want anyone getting hurt! But you’ll still get lots of interaction every day. And during your free time you can hang out on the skywalk and different viewing platforms to watch them that way. Hey Victor! You’ll have a great time volunteering with the dogs – and you’ll still have the chance to be around the elephants a bit, too! As for clothing… I was traveling around Asia for almost two months, so I did have slightly more clothing with me than I might for a shorter trip. I had 4 pairs of shorts (two I brought specifically for getting dirty at the park and donated them afterwards) and a handful of tops. And I had my laundry done once while I was there. Thank you for the amazing post. I am going in a couple of weeks to celebrate my 50 th B Day ! It has been in my bucket list for many years. I USUALLY DON’T LIKE TO TAKE MEDS SO I am debating on the Malaria pills apparently not an issue in the area. What are your thoughts? I’m not a doctor, so I can’t advise you on whether or not to take malaria pills. I personally didn’t, though. Well, remember that this place is taking care of elephants, which are pretty pricey to care for! They eat a LOT more than dogs and cats. 😉 Also, the price includes your accommodation and food for a week, so I actually think it’s pretty reasonable! I just wanted to say that I found your post really helpful and informative. Your post has almost cemented my decision on where to book. However, I’ve been researching ‘sanctuaries’ to volunteer at and have found it a real challenge to find somewhere that is actually working solely towards the conservation and wellbeing of the animals. A lot of places seem to be masquerading as sanctuaries but really have heavy tourism undertones and still have elephants trained to lay down for bathing etc. Elephant Nature Park so far, seems to be one of those, unfortunately rare, places that are purely about the animal welfare – Would you agree? Appreciate any thoughts or opinions. Many thanks Akatuki, Kindest regards, Ashleigh. ENP is truly a place that puts the elephants first! Hi, I found your posting just in time for my trip to ENP next week! I was curious how strict they were on dress code? I want to be respectful, and know in the city/temples there are rules about pants/shoulders covered/etc. I don’t want to bring anything offensive, but I know it will be hot so I don’t want to bring all pants and be miserable if running shorts or something is allowed. Thanks for your time, I learned a lot from your post!! Within the park itself, the dress code is pretty relaxed, especially when you’re actually working – I wore shorts and a t-shirt for most tasks (except for cutting grass, because it’s sharp and you want longer layers for that!). If you go into the village at all, I would maybe cover up a bit more. And when we went rafting down the river, I wore shorts and a t-shirt over my swimsuit. awesome, thanks for the reply! and one more question- did you need cash during your stay? I know meals are included, but on the website it says to allocate a couple hundred baht per day and I wasn’t sure what for. When I was there they had a small snack stand at ENP where you could purchase things like soda and chocolate bars for snacks, and you did need some cash for this. When I was in Thailand I was able to visit ENP! I did not do my volunteer work there though, my project was teaching in a fishing village in the south. ENP was the last thing we did after our entire month in Thailand, and it was definitely a highlight! It’s so interesting to read this post about what it’s like to actually volunteer there, as it was something I was wondering about while we visited. It was so eye opening to hear about the elephants and how they all had their own story of how they ended up in ENP. I wish I could have spent more time there, and this post definitely has me thinking about applying! If you ever have the chance to volunteer there, I would definitely go for it! It was such a great experience. Such a great article. I’ve been planning a visit for January for several months now and seeing this was such a fantastic way to get a sense of what to expect. I really appreciate the tips about what to bring as well. I’ve added a number of items to my pack list. For anyone who has recently completed the volunteer week, I’ve read that they are phasing out the bathing of elephants. Can anyone confirm that? Hi! I’m actually volunteering in 2 weeks! Super excited! The sandals you recommend d in your post- did you wear those the entire time or did you bring boots? I have water shoes, sneakers and short rain boots bc it’s rainy season. Just curious if you recommend anything else…although I have a lot. I plan on donating a lot. Also, could you pay for laundry as often as Needed? Thanks for the info! I didn’t bring any boots with me as I wasn’t there during rainy season; I wore those sandals the whole time there! And yes, when I was there you could pay for laundry as much as you needed, and they charged by the kilo. Hi All, i have a tourist visa for thailand and have paid for a week at ENP do I need a working visa for this? It’s tough in Thailand! Though it does thankfully get cooler in the north. The “dry” season in northern Thailand is from late November to mid-February, and that’s also when it’s the coolest. I went in February when I went, and the nights were cool enough to need a light jacket!